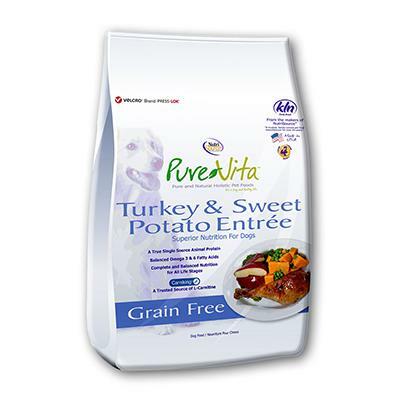 Pure Vita by Nutrisource® Turkey & Sweet Potato entree for dogs is an excellent dried kibble that focuses on providing your canine with premium, all natural ingredients that provide optimal nutrition. As your puppy grows, it can be difficult to provide your dog with a full nutrient profile, and for those nutritional benefits to come in the form of a delicious, mouth-watering, all natural dried food. Pure Vita has found the secret! This delectable grain-free food uses Turkey as it's single protein source, peas ripe with antioxidants, sweet potatoes for energy, and CarniKing®, an excellent source of L-Carnitine which helps cells thrive and function normally. Select fruits and vegetables round out this wholesome kibble. This is an excellent food intended for growing puppies and adult dogs, and is an all life stages food. Turkey, turkey meal, peas, sweet potato, pea flour, pea starch, turkey fat (preserved with mixed tocopherols and citric acid), alfalfa meal, flax seed, natural turkey flavor, dicalcium phosphate, tomato pomace, sunflower oil, potassium chloride, salt, cranberries, calcium carbonate, minerals (zinc proteinate, iron proteinate, copper proteinate, manganese proteinate, cobalt proteinate, selenium yeast), dried brewers yeast, blueberries, apples, turmeric, taurine, chicory extract, lecithin, vitamins (vitamin A acetate, vitamin D3 supplement, vitamin E supplement, niacin, d-calcium pantothenate, thiamine mononitrate, pyridoxine hydrochloride, riboflavin supplement, folic acid, biotin, vitamin B12 supplement), lactic acid, glucosamine hydrochloride, choline chloride, garlic, L-ascorbyl-2- polyphosphate (source of vitamin C), chondroitin sulfate, L-tryptophan, yucca schidigera extract, L-carnitine, calcium iodate, rosemary extract, yeast culture (Saccharomyces cerevisiae), dried Lactobacillus acidophilus fermentation product, dried Enterococcus faecium fermentation product, dried Aspergillus niger fermentation extract, dried Trichoderma longibrachiatum fermentation extract, dried Bacillus subtilis fermentation extract. 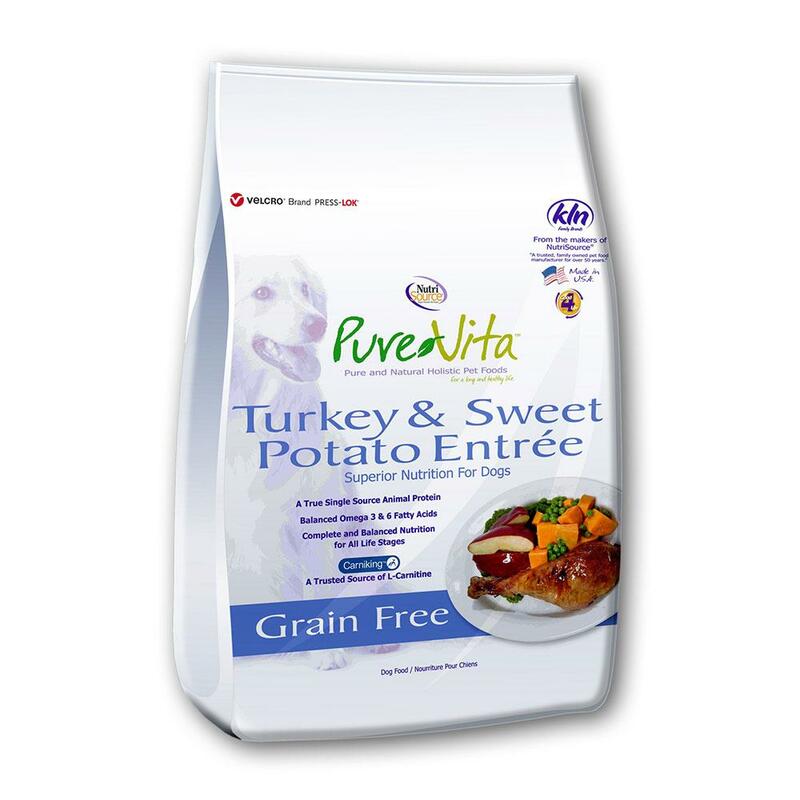 PureVita™ Turkey & Sweet Potato Entrée Grain Free Dog Food is formulated to meet the nutritional levels established by the Association of American Feed Control Officials (AAFCO) Dog Food Nutrient Profiles for all life stages.